The new Fiat 500L Diesel Hatchback is a roomy, affordable family car that comes with distinctive looks that allows it to stand out in the showroom. If you want a car that’s on-trend but also practical, it’s got a lot to offer. It looks a lot like the smaller Fiat 500 but has the added bonus of being able to offer more room and all-around usability. 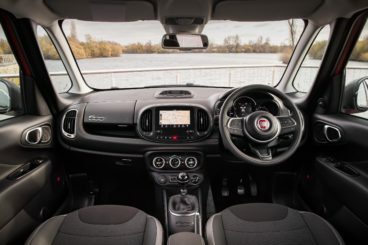 Five seats come as standard, but if you want the seven-seater version you’ll need to check out the Fiat 500L Wagon. OSV takes a closer look at what it’s all about with our 2018 Fiat 500L Diesel Hatchback review. 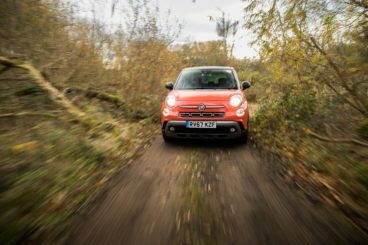 For all the things it gets right, one of the things the 500L gets wrong is the way it drives. Fiat decided to base it on their ageing Punto, and this has had a few dire consequences. Its steering is far too light and lacks feel; if you take a bend too quickly, you’ll find it hard to work out how much grip you’ve got. Body lean is an issue too, which means you’ll hardly be encouraged to take corners at pace anyway. And thanks to the car’s raised seating position, you actually feel as though you’re sat in an SUV, as opposed to an MPV. That said, people don’t often buy cars like this for a fun driving experience. However, it always helps when there’s some on-the-road entertainment. In terms of its engines, the 1.6-litre diesel is our top pick. It’s not quite as characterful as the petrols, but it offers a decent amount of mid-range punch that allows it to cope with the car at full speed. That mid-range punch is what makes all the difference in a car like this, and this engine offers a lot more torque than the petrols. It’s nippy too, and feels faster than it’s 0-62 time of 10.8 seconds. Power output, meanwhile, is 118bhp. A 104bhp variant of the same 1.6-litre diesel engine is also available, as is a smaller 1.3-litre 84bhp diesel. The latter will be far too slow for most buyers and has a 0-62 time of 15.5 seconds. It also has just five gears. Fiat set out to make a comfortable family car, so it’s a shame that the diesels are a tad on the noisy side. Engine roar is particularly bad on the motorway, as is general road noise. Go for a Cross model and you’ll also suffer from tyre noise, too. On the other hand, the seats are nice and comfortable, a height-adjustable driver’s seat is standard across the range, and the car’s suspension does a good job of ironing out most lumps and bumps. The aforementioned Cross models will fidget a bit more, thanks to their stiffer springs, but all models benefit from a power-steering system. The car’s dashboard is similar to the standard Fiat 500’s retro dash. It’s stylish, but some of the plastics are of a questionable quality. Rivals like the VW Golf have a more upmarket feel. Is the Fiat 500L Diesel Hatchback practical? All models get a height and reach-adjustable steering wheel and there’s lots of room on offer for passengers in the rear. Sliding doors are sadly missing, but three adults will be reasonably comfortable once they’re parked up in the back seats. Headroom is decent, too, and Fiat claims the car offers 1,500 different seating combinations. Storage space is good, with Fiat claiming there are 22 cubbyholes inside here, and this includes a massive glovebox. The boot, meanwhile, measures 400-litres, which makes it much bigger than the standard 500’s offering. Standard kit across the range is decent, with the entry-level Pop Star model getting 16” alloys, LED daytime running lights, Bluetooth, electrically adjustable and heated door mirrors, cruise control, air conditioning and a 5” touchscreen. The Mirror model adds Apple CarPlay and Android Auto connectivity, a digital radio and a seven-inch UConnect infotainment system, while the Lounge model gets a glass roof and a useful climate control system. Rounding off the range is a more robust Cross model that comes with an enhanced traction control system, a raised ride height and automatic emergency braking. In terms of how safe the car is, the Cross model is the safest in the range because it comes with more safety kit, but all models are well-equipped and the Fiat 500L was awarded all five stars when it was crash tested by Euro NCAP. Its standard safety kit includes electronic stability control, traction control, anti-lock brakes and plenty of airbags. Prices for the new car start out from £16,195 and rise to £21,320. To find out more about our leasing deals, you can check out our page here. In terms of its running costs, the diesel engines are nice and frugal. The 1.3-litre engine is the cleanest in the range, and it’s also the cheapest to run; it can return over 70mpg and emits just 105g/km of CO2. However, it’s the one we’d recommend you overlook if your budget stretches further as it’s a tad underpowered for a car of this type. The bigger, more competent 1.6-litre diesel engine returns 62.3mpg on a good day and emits around 118g/km. That said, there’s a big difference in what you’ll pay for insurance costs. The smaller 1.3-litre engine sits in insurance group 7, while the 1.6-litre diesel occupies group 18. They’re nippy and affordable to run. Rear seat space is good, and the car’s boot is twice as big as the Fiat 500’s. It looks almost as good as the standard 500 model. The standard 500 model holds onto over half of its purchase price after three years, but this 500L version will struggle to retain over 40%. Being based on the dated Fiat Punto doesn’t help at all. Let’s see how the car fares against its rivals in the comparison section of our Fiat 500L Diesel Hatchback review. One thing the new Ford C MAX is which the Fiat isn’t is that it’s fun to drive. 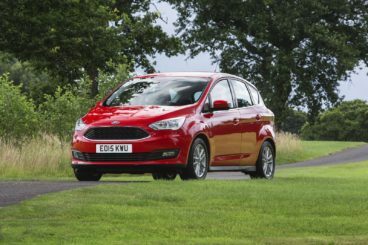 Fords are traditionally among the most entertaining cars to drive in their sector, and the C MAX is no different. It might be an MPV, but it handles more like a Hatchback. Indeed, the way it drives isn’t all that dissimilar to the Ford Focus. The suspension is a bit on the firm side, but it means that body lean is kept to a minimum. Meanwhile, the steering is responsive and accurate, and all models get torque vectoring as standard, a system that makes you aware of how much grip you have. In terms of its diesel engines, all of them are workhorses that suit a car like this down to the ground. A 1.5-litre diesel that produces 118bhp is our top pick, and it can cover the 0-62 dash in a respectable 11.3 seconds. A 2.0-litre diesel that develops 148bhp is a lot faster, however, and it can cover the same sprint in just 9.2 seconds. It’s a strong engine that’s got plenty of pulling power. And because it’s quiet, it’s an engine that won’t get on your nerves on longer trips. However, it’s fairly expensive to buy and adding the PowerShift automatic gearbox will set you back a further £1,300. Running costs? The smaller diesel is naturally the cheapest to run and it can return as much as 69mpg on a good day. That’s impressive, and while the 2.0-litre engine is considerably bigger, it can still return a very decent 64.2mpg. Inside, the Ford’s dashboard isn’t anywhere near as retro as the Fiat but it’s stylish – if a bit cluttered. All models come with a digital radio, air conditioning and a heated windscreen, and are on the whole well-equipped. Is the Ford C-MAX practical? The supportive seats are nice and firm, while a high driving position offers excellent visibility. The steering wheel and driver’s seat itself offer plenty of adjustability, too. The rear seats are low and the car’s roofline is high, and this helps with headroom, which is good for all. That said, when three adults are sat back their space will be a bit tight, but legroom is perfectly fine. The boot, meanwhile, measures 432-litres and can be extended to 1,684-litres by folding the rear seats. The new Vauxhall Crossland X is a practical, rugged and comfortable large family car that’s also one of the safest around. One thing it isn’t is fun to drive. Like the Fiat, it boasts a raised ride height, but this causes more problems than it solves. For one thing, insulation is a major issue, while the car sways when you travel over rougher road surfaces. Body lean is a bit of a problem too, and the Crossland X doesn’t exactly offer a relaxed driving experience. On the other hand, the steering is quick and responsive, the driving position is good and the ergonomics are perfectly fine. In terms of its engines, there’s only one diesel available. This is a 1.6-litre unit that’s available in two guises. The smaller develops 98bhp, while the bigger variant develops 118bhp. The latter is our top pick as the former is noisy and loses power as you move up the rev range. The 118bhp variant also comes with a 6-speed manual ‘box while the 98bhp is limited by a 5-speeder. Running costs? The Crossland X isn’t as heavy as it looks, and this helps to keep costs down. However, few people could expect the 1.6-litre 98bhp diesel to return as much as 78.5mpg, but – according to official figures at least – that’s exactly what it can manage. The bigger 118bhp variant, meanwhile, just scrapes 70mpg on a good day. Inside, the Vauxhall is more sensible-looking than the Fiat, and for some buyers that might translate as “bland.” There’s not much wrong with it per say, but some of you who are looking at the Fiat will find it too conservative. Put it this way, there are plenty of dull greys and blacks in here. It gets a pleasant soft-touch dashboard top, though, while its steering wheel feels great in your hand. We were impressed by its infotainment system, too. 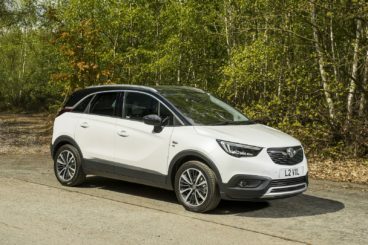 Is the Vauxhall Crossland X practical? Practicality is its main strength. It’s wider, taller and longer than the Peugeot 2008 (the car on which it’s based) and ergonomically speaking, it’s brilliant. A central armrest is perfectly positioned, as is the driver’s side door armrest, the steering wheel and the pedals. Head, leg and knee room is very good up front and in the rear, while you can pick up a £300 Versatility Pack to make the car even more practical. The boot, meanwhile, measures 410-litres and can be extended to 1,255 if you fold the rear seats. It looks good, offers a good amount of room, and is easy and cheap to drive. However, it won’t be flavour of the month for everyone; its retro aesthetics are divisive, and it doesn’t handle as well as a Ford. The Fiat 500L Diesel Convertible is a good car – but not for everyone.